WOOD DALE, Ill., Oct. 17, 2018 /PRNewswire/ -- AAR (NYSE: AIR), a global provider of aviation services, will partner with Zodiac Aerospace to distribute their water and waste product portfolio to the global airline, MRO and supporting markets effective November 1, 2018. Under this agreement, AAR will use analytics to proactively develop opportunities enhancing the success of Zodiac Aerospace's commercial aerospace customer base. AAR will stock material throughout the Company's worldwide warehouse network with locations in Chicago, Germany, Dubai, Singapore and Shanghai. AAR's expertise in inventory management, customer service and AOG support will provide the airline market decreased lead times on Zodiac's flight critical components. "Zodiac Aerospace Services and AAR have worked closely for a long time. 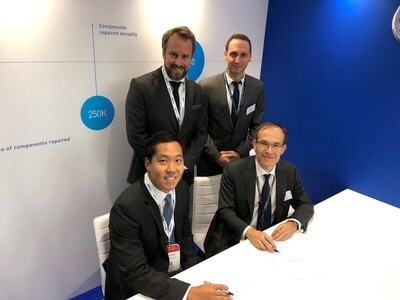 We are very excited about the potential of the new combined organization and look forward to benefiting from AAR's global footprint as well as its service to airlines and customers on Zodiac Water & Waste parts," said Guillaume Bunoz, EVP Product Management, Business Development & Marketing for Zodiac Aerospace Services. "AAR is excited to partner with Zodiac Aerospace. We expect this agreement to further enhance the customer service offered to customers worldwide, while maximizing sales opportunities for Zodiac Aerospace Services," said Eric Young, Senior Vice President, OEM Solutions, AAR.